How do I delete items from my shopping cart? I can’t add items to my shopping cart. What do I do? What do I do if I forget my password and can’t log on to the site? How do I track my order and check its status? When will I receive an email confirmation of my order? How Do I reheat my Maryland Blue Crabs? How do I steam live Maryland Blue Crabs? How do I eat Blue Crabs? Once you have selected the item(s) that you want to add to your shopping cart, simply select the quantity you wish to order and then hit the Add To Cart button to add the selected item to your shopping cart. At this point, you can continue shopping or check out. You may delete unwanted items from your shopping cart by clicking on the "X" button located on the right side of the item in your shopping cart. I can’t add items to my shopping cart.What do I do? What do I do if I forgot my password and can not log on to the site? All passwords are case sensitive. Please retry entering your password. If you forget your password, click on the "Forgot Password" link. Once you type in your email address at the prompt new login key will be sent to you. Click the link in the e-mail to sign in, and then change your password. If you still cannot log on to the site, let us know by emailing us at customerservice@usaseafoodco.com and we will reset your password for you. Our site features live online order tracking. When you place an order, you will receive an email order confirmation which will contain a link so you can check on the status of your order. You can also go to the My Account section of our website and use your order number to check the status of your order. If you have any questions regarding tracking, please email us with your order number at customerservice@usaseafoodco.com or call us Tollfree at (800) 385-3909. We pride ourselves on prompt and accurate shipping of all orders. Depending on your selected delivery date, orders received by 3:00 P.M. Easter Standard Time (EST) Tuesday through Friday are shipped the same day. Weekend orders and orders placed on Friday after 3:00 P.M. Eastern Standard Time (EST) will be shipped on Monday. All perishable orders are shipped overnight. Delivery date will be selected by you when you place the order. UPS Next Day delivery by 10:00 A.M. Eastern Standard Time (EST) is available for an additional charge. At final checkout, you can select this shipping option and the cost will be automatically calculated for you. Please note that delivery times for UPS Next Day delivery by 10:00 A.M. (EST) refer to business days only and excludes weekends and holidays. Hours: Monday through Friday 11:00 A.M. to 6:00 P.M. Eastern Standard Time (EST). By Phone: Call us Tollfree at (800) 385-3909 if you are calling from the United States of America. We are here to help! If you have already placed an order, have questions for us, or require assistance from our Customer Care staff email us at customerservice@usaseafoodco.com. By Phone: Call Customer Service Toll free at (800) 385-3909. If you have an issue, we want to make it right! Please email us at customerservice@usaseafoodco.com with a description of your specific question or issue. We work to answer our emails within 24 hours or feel free to call us Toll free at (800) 385-3909 and we will be happy to assist you. 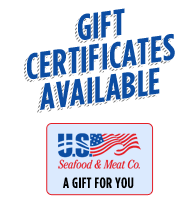 Due to the nature of our business and the products, we offer, items purchased through the usaseafoodco.com website cannot be returned. U.S. Seafood & Meat Co. strives to ship the absolute freshest seafood available anywhere. Every item we sell is carefully inspected before it is packaged and shipped. When your order leaves our facility, it is packed with more than enough refrigerant to prevent spoilage for at least five (5) days in transit. If our seafood arrives damaged, please contact us immediately. If your order is spoiled or damaged due to negligence by U.S. Seafood & Meat Co., we will replace it free-of-charge. All concerns must be received within 48 hours of delivery. If you receive an order that you suspect is spoiled, contact us immediately and please do not discard of any suspected spoilage or damaged products until a representative from U.S. Seafood & Meat Co. is contacted. We may request that you return them to us for inspection. Since U.S. Seafood & Meat Co. offers nearly all perishable products, shipping ALL our seafood in the freshest condition takes thought and careful planning. We've come up with our own fresh gel pack system that keeps perishables cool in transit for up to 48 hours. We take care to arrange your seafood in specialized boxes designed to keep your order in the freshest possible condition upon arrival. We are dedicated to providing you with the freshest hard shell crabs and seafood on the web, therefore, if you have any questions about our Return and Refund Policy, please feel free to call us Toll free at (800) 385-3909. Since the art of crabbing depends on conditions beyond our control U.S. Seafood & Meat Co. reserves the right to pack an equivalent dollar amount of crabs to fulfill orders. You will receive an email confirmation within a few minutes of placing your order on our website. First Step: Set steamer for one (1) minute at a hard steam, and the remaining duration lower to a regular steam. Once your blue crab is steamed and has a bold orange color place it upside down on the top shell to have the belly up. Find what is known as the tab or flap on the belly of the crab. The tab on a male crab looks like the 'Washington Monument' and the flap on a female is wide and looks like the 'top of the U.S. Capital'. Pry this tab or flap up with the point of a knife then tear it off and discard it. Using your thumbs separate the top and bottom of the shell. The bottom part contains the entire body of the crab which will be picked in the following steps. The top half of the shell will contain nothing except a small amount of yellow substance which believe it or not is edible and referred to by many as the mustard or the tomalley. Next remove the lungs with are sometimes called the devils fingers. Remove them by pinching them between your thumb and the side of your knife using a scraping pulling motion. Remove and discard the lungs from the left and right side of the crab. Do not eat the lungs of the blue crab. Grip the crab so that you have one side of the crab in each hand bend each side down or up until it is broken into two halves also called clusters. Now that you have two clusters with each consisting of a claw, three legs, and a back fin you are very close to finally picking the much anticipated meat. First locate the back fin which is the small swim fin located opposite the claw on either one of your two clusters. Using your thumb and index finger squeeze the back fin lightly just above the joint to the inside of the body then gently pull with a very easy twisting motion removing the most desired meat on the crab that should still be connected to the back fin which still may have a little bit of the thin white shell still surrounding the meat that can be easily removed revealing the white fluffy meat. Now take the remaining part of the cluster which is now minus the back fin and squeeze the inner part of the crab shell not crushing it rather just cracking it enough to allow the meat to separate from the shell enough to slide out in the next step. This cracking the crab in a skill that takes practice over time do to the fact that every crab shell is of different hardness depending on the crabs individual stage in the molting process. Once the body of the crab has been cracked and squeezed you can now take your knife and between the squeezed parts cut down the centers of each camber just down to where the legs fasten to the body. Now since we did not remove the legs yet but did however loosen up the innards also known as the meat of the crab by squeezing and made a little slit with the knife we will pull the legs out gently and if lucky all the meat will be hanging from the base of the leg. If you are not so lucky just pick the meat out with the point of your knife. Even with practice the meat will not always come out perfectly attached to the leg. After getting the biggest easiest pieces out of the body as in Step 7 use the point of your knife and fingers to separate the rest of the thin white shell cavities that makes up the inside of the crab. This is the most time consuming and unrewarding part of your picking experience in that the pieces of meat get smaller and are more difficult to remove however there is plenty of meat remaining to be worth your while. Finally! The chance to eat the much awaited claw meat. To get to the claw meat you hold straight with the joint extended bending it back opposite to the way the joint naturally bends then with a mallet or the handle of a knife strike the center of the claw. This requires the most skill and practice to master because you want to only crack the shell 1/4 of the way threw just enough to remove the shell from the large fluffy meat without pulverizing the shell into the meat. Once the large fluffy chunk of meat is revealed pinch the cartilage at the widest side of the meat careful not to bite off the cartilage while pulling it out leaving the piece of claw meat in your mouth to enjoy! Lastly the remaining six legs of the Maryland blue crab have very little meat and are often discarded while there are other people who will ask for any leg that may have broken off in the pot during steaming so they can savor each little morsel, if this is you then simply focus on the thickest part of the leg between the joint that was fastened to the body and the next knuckle moving toward the tip of the leg, snap and remove that knuckle and small remaining segments and in your hand will be the remaining largest segment of the leg. Snap the joint side that would have connected to the body and slide out tapered sliver of meat and consume.